Monday, Chief Administrative Officer, Dr. Robert Blaine along with Data Scientist, Lacey Loftin, unveiled the OpenGov data portal for the City of Jackson. 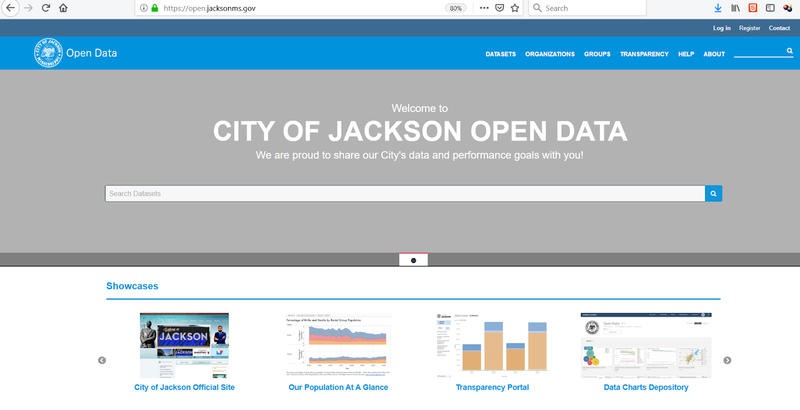 The OpenGov portal, which is open and free for the public to use, includes data compiled from federal agencies, including the US Census Bureau, and the City of Jackson’s digital systems. “One of our goals in this work is to provide something more robust than what we’ve had historically. So, the ability to dive down into individual categories and to be able to access those numbers over a period of time, allows us to be able to both build on historical data and give clarity for where the numbers have been historically as well,” said Dr. Robert Blaine. The OpenGov data portal includes vital information on a number of categories ranging from population and poverty data to crime incident data and 311 reporting. The site currently offers 43 different charts and tables as well as “showcases” which will allow the city to show stories based on the data provided. Data found on the OpenGov website is also available to be downloaded or embedded for publication. Future plans for OpenGov include integrating real-time data into the portal as the City of Jackson moves towards a more automated system. To explore the OpenGov data portal, please visit open.jacksonms.gov. For more information about the site, email Lacy Loftin at opendata@jacksonms.gov. May I ask why everyone addresses him by his 3 names. Why not just the Mayor Lumumba? I don’t ask anyone to address me by my 4 names. Just went to the site. Many of the links don't work. Sounds like a wholistic approach to a bunch of bovine scatology for the collective to use this to fit their narrative versus letting the facts do the talking that Jackson is a Sh!thole and the powers to be and it's citizens are making it an unsafe place to visit. 311 calls will probably be utilized more so than 911 calls if I am a betting man to fit the agenda. This is pathetic. One nice map showing the obvious black and white areas where people live. But a category for "Chlamydia"? With no data. Now that is really helpful. All websites have glitches to work out. Kudos to the City for changes such as this. Patience folks. Rome wasn't built in a day! Three months from now I'm sure it will be filled with useful data. I am confident that this new portal will single-handedly fix the potholes, crime,water, and zoo issues. Way to go Baby Chok. You be da man. 1:22 must be the "Data Scientist". So they decided to take various data points that can be found and are free to anyone on various websites (statsamerica, Census, On the Map, fact finder, etc) and paid to have it all on one page? For who? Why? Not sure I understand why this was needed. Because its more than just census data, 3:10. It's going to be a "One-Stop Shop" for researching various aspects of city gov't, such as budgets and spending, Public Works maintenance and capital projects, crash data, crime stats, building permits issued, location of public facilities, etc. The new web portal is the perception of "doing something." Baby Chok - you da radical man. Dear Cynical: You got 'dat right. Good comment. What the hell is a "Data Scientist"? A nepotism/cronyism position created for the friend girl?? Will be interesting to see if there will be a chart showing the time and expense of creating and managing this site. I love this portal. Especially after I read the mayor’s Strategic Plan for the Dignity Economy.